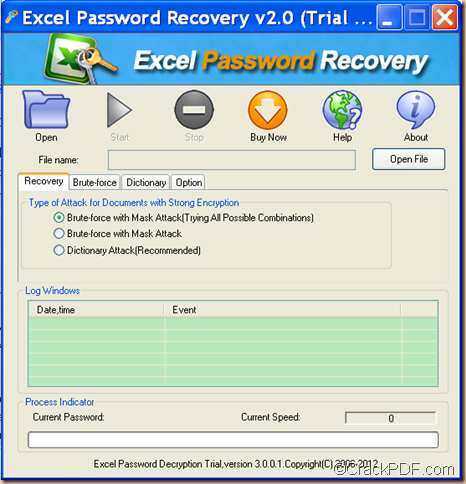 It can help you recover Excel password and reopen your locked Excel file in an easy way. With the application CrackPDF Excel Password Recovery, you can easily unlock encrypted Excel spreadsheets. Microsoft Excel is an electronic spreadsheet application for storing, organizing, manipulating data. Excel spreadsheets organize data in horizontal rows identified by numbers (1, 2, and 3) and vertical columns with letters of the alphabet (A, B, C). The intersection point between a column and a row is a small rectangular box known as a cell. A cell is the basic unit for storing data in Excel spreadsheet. 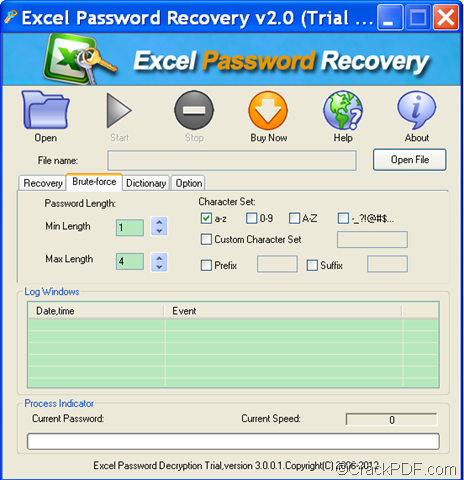 CrackPDF Excel Password Recovery is a powerful Excel password recovery application. It can recover Excel password and unlock password protected Excel files created by any version of Microsoft Office Excel 1997-2010 with easy operations. In the following contents, you will see how to use it to unlock Excel spreadsheets that are protected by passwords. 1. 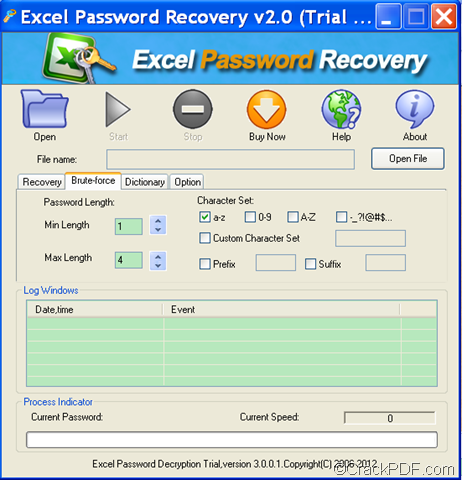 Please free download CrackPDF Excel Password Recovery. After the download, you can double click it and follow the setup wizard to install it on your computer. 2. After the installation, you can see its user interface on the screen and then you can add the encrypted Excel file into the application via one of the following methods. Click the Open button in the tool bar on top the interface to open file picker window in which you can choose the file. Directly input the Excel file path in the “File name” input box. Click the Open File button beside the “File name” input box to choose file from the file picker window. 3. In “Type of Attack for Documents with Strong Encryption” group box in the middle of the interface, please choose a recovery method. Dictionary Attack (Recommended) is a recommended method. It will recover password for the Excel spreadsheet with the built-in or self-added dictionary, which will greatly shorten the recovery time. If you choose this method, please do not forget to click the Dictionary tab to set a dictionary and other parameters. Please see it in the following snapshot. You can set a default dictionary or add a new dictionary in this interface. You can also set mutation count and max password length. Then, please click the Start button on top of the interface to start to unlock the encrypted Excel spreadsheets. If it fails, you can try the other two methods. At last, if you are interested in this application, please download CrackPDF Excel Password Recovery by clicking the following button. If you forget the password of MS Excel worksheet and you need to use it urgently, please have a try of the application CrackPDF Excel Password Recovery. It can retrieve password for Microsoft Excel worksheets. Microsoft Excel, as a part of Microsoft Office, is widely used for storing, organizing, manipulating data, performing quick mathematical calculations, etc. 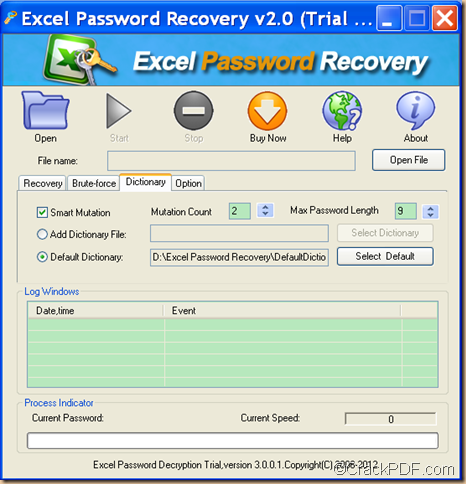 CrackPDF Excel Password Recovery is a professional application that can recover password for Excel files created by any version of Microsoft Office Excel 1997-2010. To know how to use this application to retrieve Excel password, please continue to read the following paragraphs. Firstly, please download the installer of CrackPDF Excel Password Recovery. Then, please double click the installer and follow the setup wizard to install it on the computer. After successful installation, you will be able to open the application and see its interface on the screen. Then, please click button Open in the tool bar on top of the interface or button Open File beside the “File name” input box to add the password protected Excel file into the application. Thirdly, please choose a recovery option in the “Type of Attack for Documents with Strong Encryption” group box under the “Recovery” tab according to your actual situations. If you remember something about the Excel password, please choose the “Brute-force with Mask Attack” option. Then, please click the Brute-force tab beside the “Recovery” tab to open the “Brute-force” panel. You can see it in the following snapshot. In “Min Length” and “Max Length” spin boxes, you can set minimal and maximal password length. In the “Character Set” part, you can set the password in pure numbers, lowercase letters, capital letters, etc. You can also customize the character set. In “Prefix” and “Suffix” edit box, you can set the prefix and suffix. If you remember nothing about the Excel worksheet password, please try the “Dictionary Attack (Recommended)” option first. If it is of no use, please try the “Brute-force with Mask Attack (Trying All Possible Combinations)” option. Lastly, please click the Start button on top of the interface to start to retrieve the password for the Excel worksheet. In the end of this article, if you would like to have a try of this application, please click the following button to download CrackPDF Excel Password Recovery. If you want to recover passwords for Microsoft Excel spreadsheets, CrackPDF Excel Password Recovery will be a good assistant for you. Microsoft Excel is an electronic spreadsheet application that can be used for storing, organizing and manipulating data. It features calculation, graphing tools, pivot tables, etc. You can use it to organize your data into rows and columns. The horizontal rows are identified by numbers (1, 2, and 3) and the vertical columns with letters of the alphabet (A, B, C). You can also use it to perform mathematical calculations quickly. 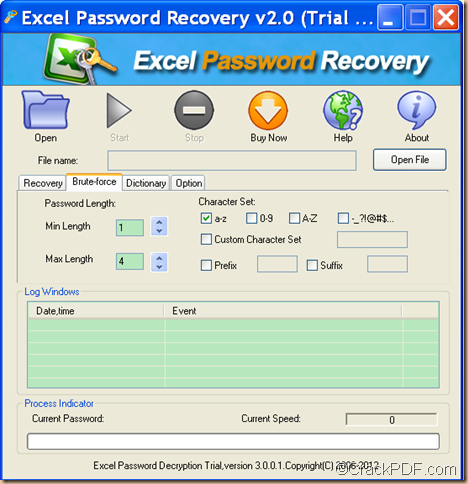 CrackPDF Excel Password Recovery is a professional Excel password recovery tool. It can retrieve password for Excel files created by any version of Microsoft Office Excel 1997-2010. Please download CrackPDF Excel Password Recovery and install it on the computer by following the setup wizard. After opening the application, you can see its user interface as shown in the next snapshot. In the tool bar on top of the user interface, please click the Open button to open file picker window and add the encrypted Excel file into the application. You can also click the Open File button beside the “File name” input box to load the file. In group box of “Type of Attack for Documents with Strong Encryption” under the “Recovery” tab, please choose a recovery method. Dictionary Attack (Recommended): If you remember nothing about the Excel password, you are strongly recommended to try this method first. After you choose the option, please click the Dictionary tab to make some settings. If it fails to recover the password, you can try the “Brute-force with Mask Attack (Trying all Possible Combinations)” option. Brute-force with Mask Attack: If remember something of the Excel worksheet password, please choose this option and then click the Brute-force tab beside the “Recovery” tab to set the related parameters. At last, please click the Start button on top of the interface to start to recover the password for the Excel worksheets. This is the end of this article and you can click the following button to free download CrackPDF Excel Password Recovery. 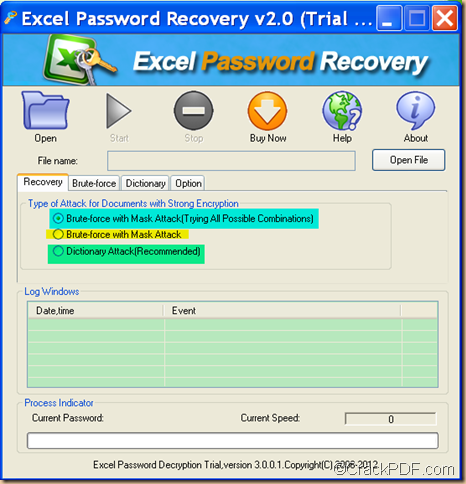 The application CrackPDF Excel Password Recovery is able to decrypt password protected Excel files. 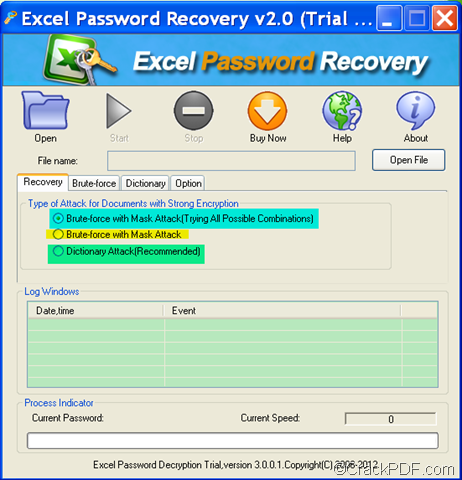 CrackPDF Excel Password Recovery is a Windows application that can help you decrypt encrypted Excel files in an easy way. It can decrypt the Excel files in three methods: Dictionary Attack (Recommended), Brute-force with Mask Attack, Brute-force with Mask Attack (Trying All Possible Combinations). In the following paragraphs, it will focus on the dictionary attack method to recover password for password protected Excel files. 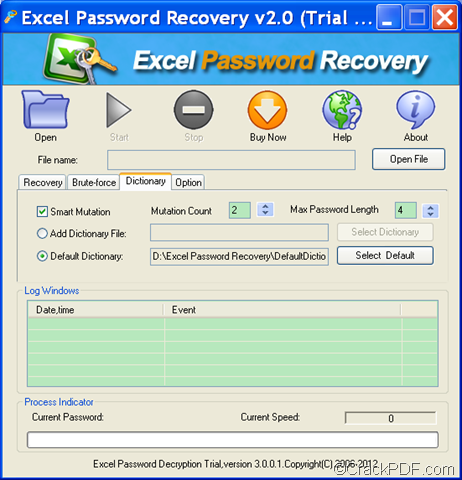 Please click to download the package of CrackPDF Excel Password Recovery. To install the application, you need to double click the installer and follow the setup wizard. After the installation, the application will run and you are able to see its interface on the screen. To add the locked Excel file, you can click the Open button in the tool bar on the interface or click the Open File button on the interface to open file picker window and choose file from the window. Check the radio button of “Dictionary Attack (Recommended)” in the “Recovery” tab panel. Then, please click the “Dictionary” tab on the interface. You are able to see an interface like the following snapshot. On this interface, you can set mutation count and max password length by checking the radio button of “Mutation Count” and entering numbers into the editing boxes. You can also add a new dictionary by checking the radio button of “Add Dictionary File” and clicking the “Select Dictionary” button on the interface. To start to decrypt the encrypted Excel, please click the Start button on the interface. This useful application can be free downloaded via clicking the following button. 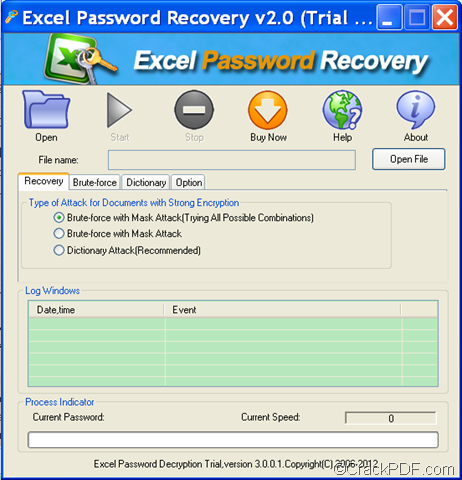 Just have a try and you will love CrackPDF Excel Password Recovery. 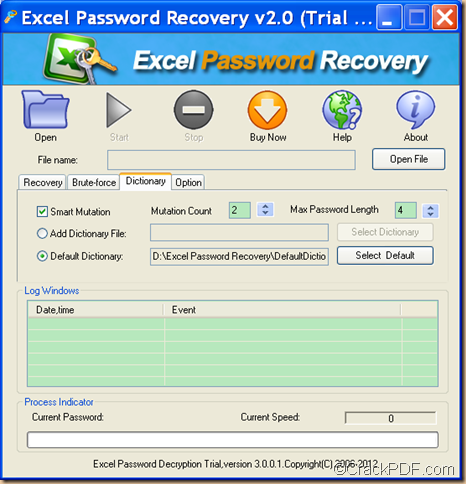 With the help of CrackPDF Excel Password Recovery, you can easily retrieve MS Excel password. 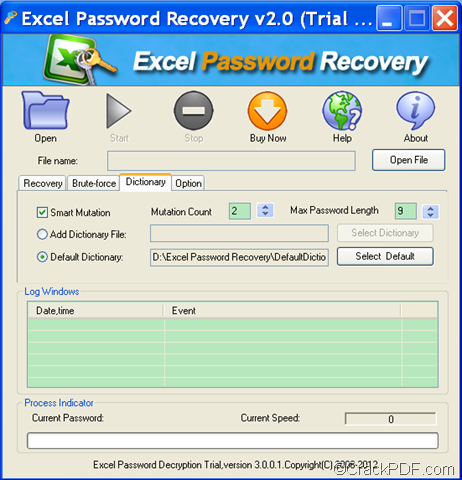 If you want to see how to use it to recover password for Excel files, please go on reading this article. To allow only authorized users to view or modify your data in your Excel file, you can set a password to protect the Excel workbook. However, in some occasions, you may forget Excel file password. If that happens, you are able to use the application CrackPDF Excel Password Recovery to retrieve password for your Excel file. 1. Please download CrackPDF Excel Password Recovery and install it on your computer by following the installation steps. 2. Open the application and add the password protected Excel file. There are two ways to add the Excel file into the application. Click the Open button in the tool bar on the main interface to open file picker window and select Excel file from the window. Click the Open File button on the main interface to add the file. 3. In the Recovery tab, there are three types of attack. If you can recall some part of the password, length of the password, etc., please check the radio button of “Brute-force with Mask Attack” in the “Recovery” tab panel. Then, please click the “Brute-force” tab on the interface to open the “Brute-force” panel. You can see it from the following snapshot. In “Min Length” and “Max Length” edit boxes, you are able to set maximal or minimal password length. In Character Set part, you are allowed to set the password in pure numbers, lowercase letters, capital letters, etc. You can also customize the character set. 4. Please click the Start button on the main interface to retrieve the Excel file password. If you are interested in this application, you can click the following button to download CrackPDF Excel Password Recovery. How to recover Microsoft Excel password? Have you forgotten your Microsoft Excel password? 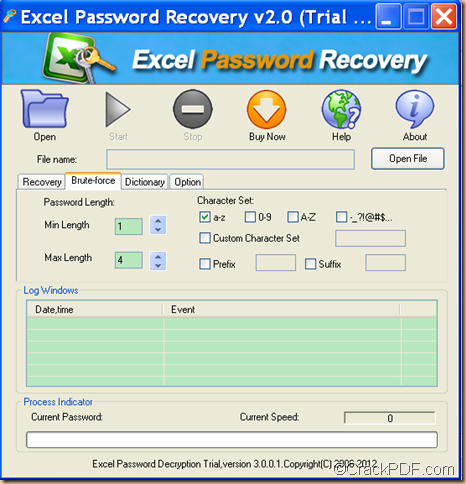 CrackPDF Excel Password Recovery can help you recover password for your locked Excel file in an easy way. Then, you can follow the steps below to retrieve the forgotten password of your Excel files. 1. Double click the .exe file in the download package and follow the setup wizard to install and launch CrackPDF Excel Password Recovery. 2. Click the Open button in the tool bar or the Open File button on the main interface to add the password-protected Excel file. Dictionary Attack (Recommended) is a method that can help you try each single word or word combinations in a built-in dictionary or an added dictionary to recover the forgotten Excel passwords. Brute-force with Mask Attack is useful when you can remember some information about the forgotten Excel file password. It will try possible character combination of pure letters, pure numbers, etc. to retrieve the password. Brute-force with Mask Attack (Trying All Possible Combinations) will try all possible password and combinations, which may take longer time than the other two attacks. If you choose Dictionary Attack (Recommended) or Brute-force with Mask Attack, please click the “Dictionary” tab or “Brute-force” tab on the interface after you check the radio button of “Dictionary Attack (Recommended)” or “Brute-force with Mask Attack” to set the related parameters. 4. Click the Start button in the tool bar to start the recovery of the Excel password. Via clicking the button below, you are able to download free trial version of CrackPDF Excel Password Recovery. Just have a try and you will find that it is a practical application.